supported the story of an obsession: that of the study of light, its movement, to the point of taking form like a part of the five points of architecture. In its compositional narrative, a further concept, la promenade architectural, marked the relationship between the body and the elements of a work, including this movement as a reason for the endeavour. Light and bodies in movement like the heartbeat of a fluid and continuous spaciousness. 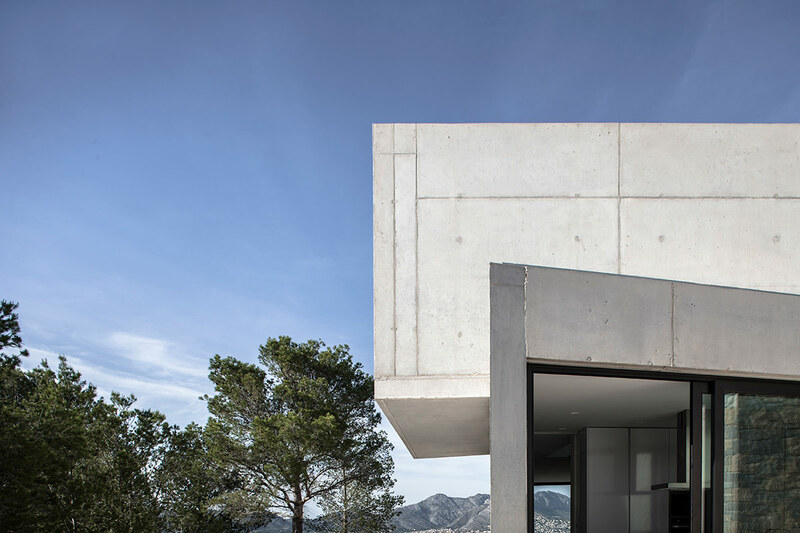 These basal parameters of architecture are interpreted in the Casa l’Aspre (the Aspre House) project of nomarq| estudi d’arquitectura, a house in the Alicante town of Orba, situated on a pentagonal plot of nearly 1000m². The plot in a pencil-like form is marked by a steep slope, as is common in this area, which descends from south to north, surrounded by the perpetual presence of the sea, by Mediterranean vegetation of the characteristic green of the east, and by a residential and extensive occupation of the land. 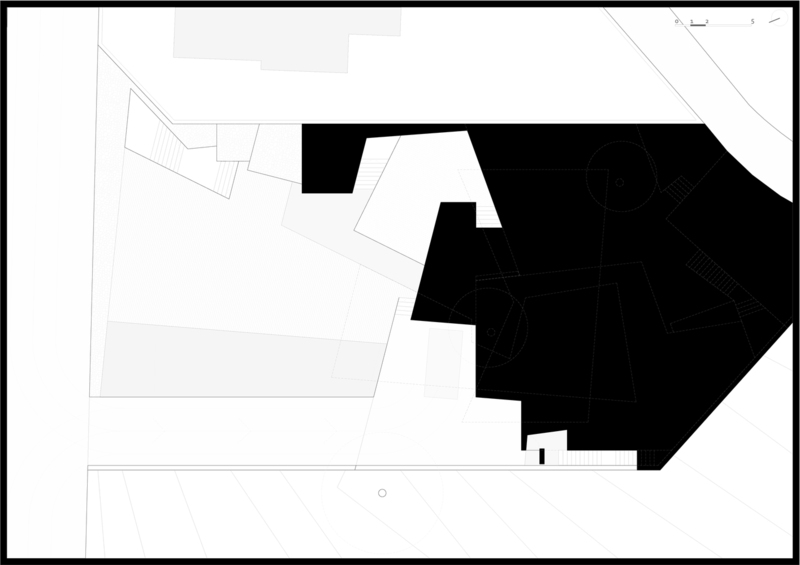 In fact, the unfamiliar and isolated dwelling constitutes the only typology. 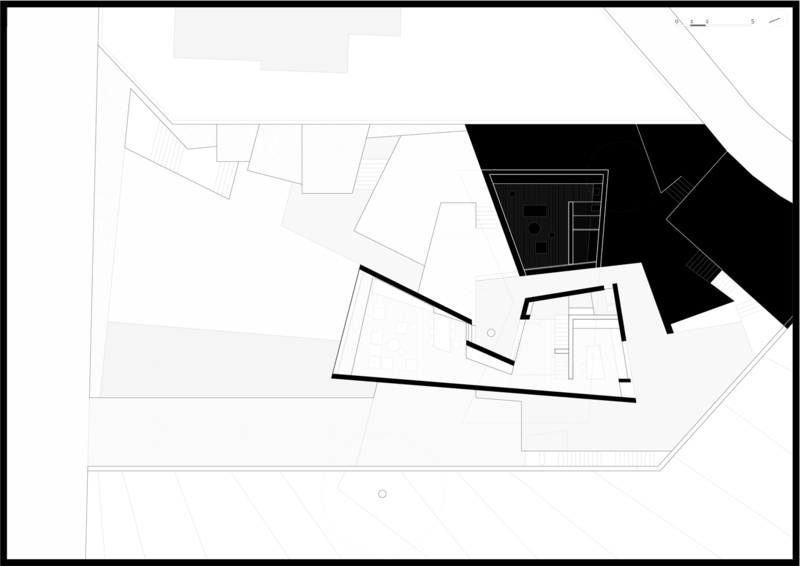 Despite the fact that the house project of the nomarq study represents the surrounding typology, it distances itself completely from the predominant architectonic language, addressing from its personal perspective the elements of volume, light, pathways, density, landscape and movement like objects of architecture. 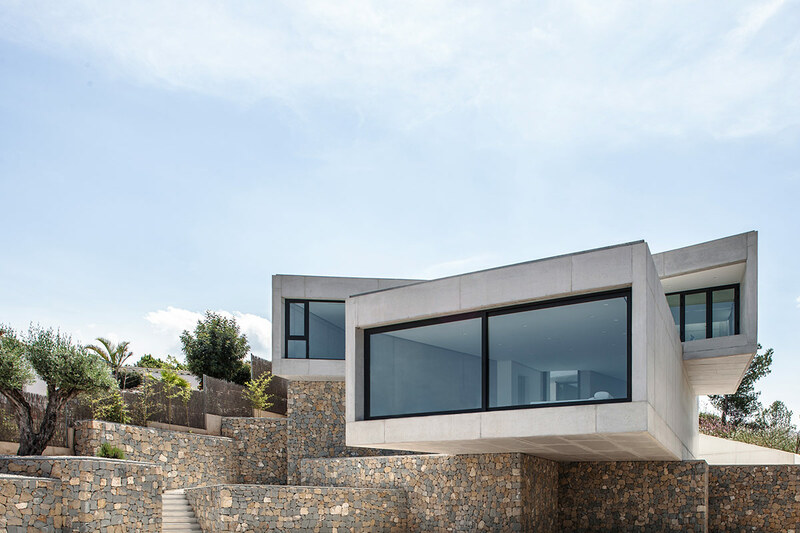 In terms of the location of the plot, the house is situated on the central part of the terrain, a position which allows it to frame the best panoramas, including the sea in the background. 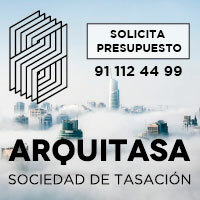 Access to the house is thus found at the lowest level, connected to the street and establishing the first point of promenade of the Aspre House. Whilst within the body of the house the principal programme of uses is dealt with, this lower part addresses the programme of parallel services: road access, a garage, a swimming pool, outdoor spaces e.t.c, with everything organised on flat gravelled terraces and underpinned by stone masonry. 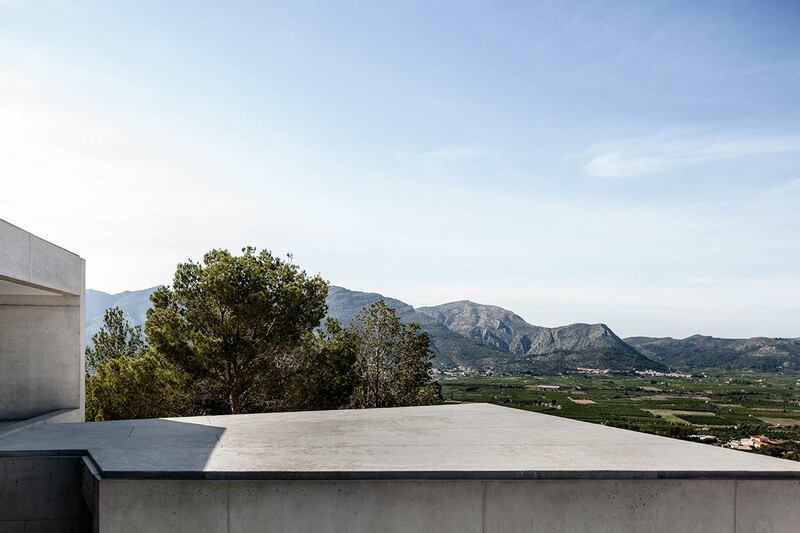 The organisation of the outdoor space results from the topography of the terrain, but also from the desire to preserve the existing woodland on the plot. 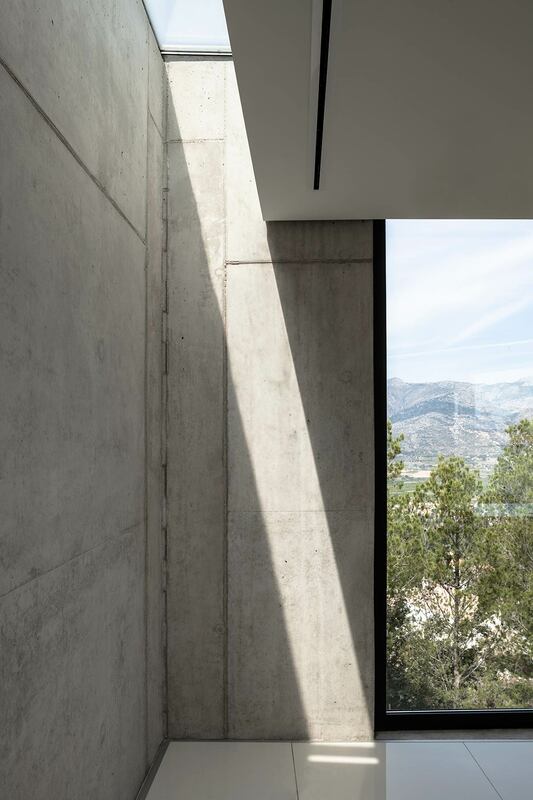 In the aridity of the new house terrain, in which varying stone materials overlap, one can also spot the presence of forgotten vegetation throughout the house, giving it an enhancing backdrop. 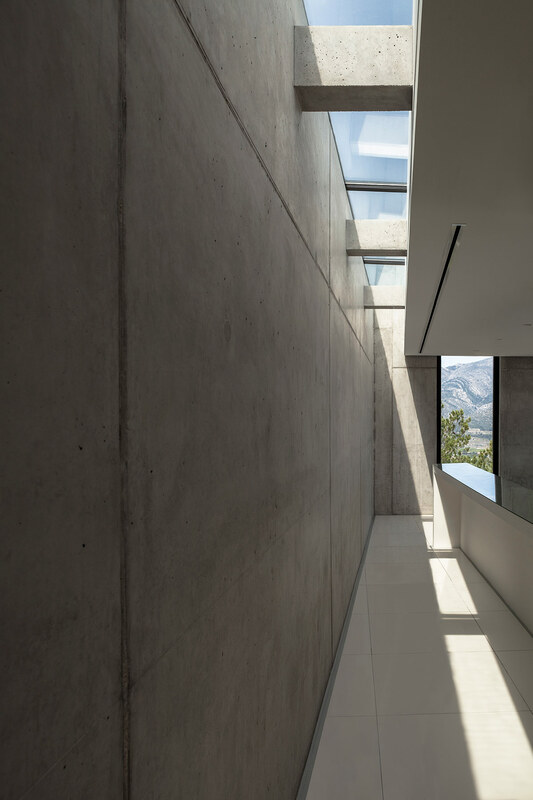 On the ascending trail to the house, the pathways of the plot create an alignment of visuals, in which the volumes of the house, placed like two superposed parts are seen in their ultimate grandiosity. 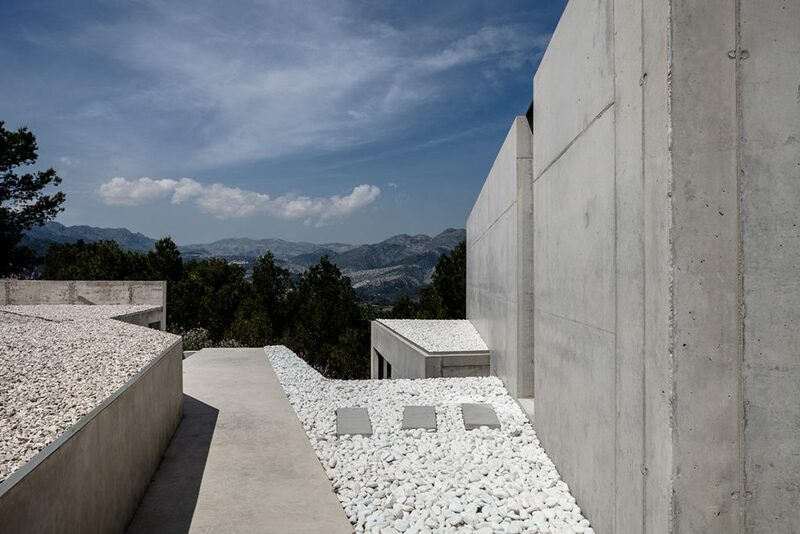 In this way, the Aspre House is structured over two levels, two boxes of reinforced concrete, of an expressive nature, orthogonally situated and supported by the same stonework walls which divide the garden. Each room, responding to the programme of uses, whilst also possessing clear relational intentions, is dedicated to a day and night use on the ground and first floors respectively. 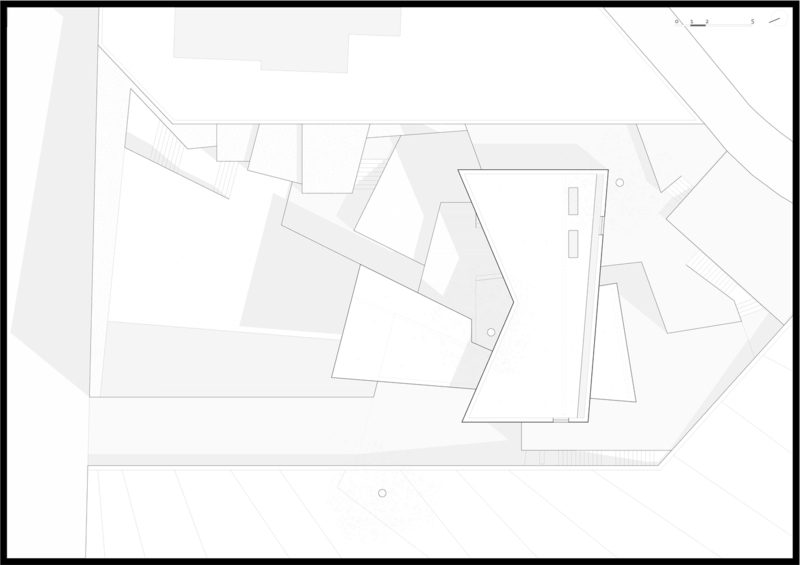 At the convergence of both prisms, the access is found, distorting itself slightly towards the interior of one of its larger sides in order to indicate the entry and preserve part of the existing vegetation. 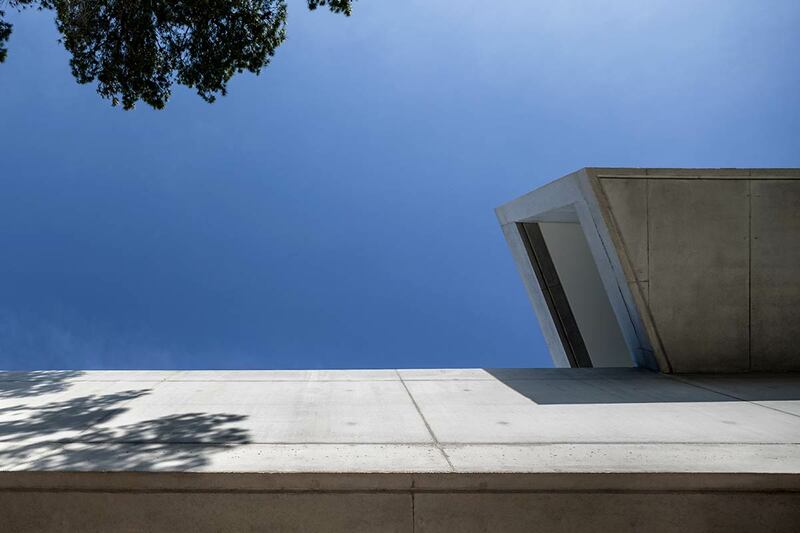 The hard concrete doubles up on itself so that the tree can grow, like flowers born of a rock, whilst also enabling the appearance of intermediary spaces such as galleries and terraces. 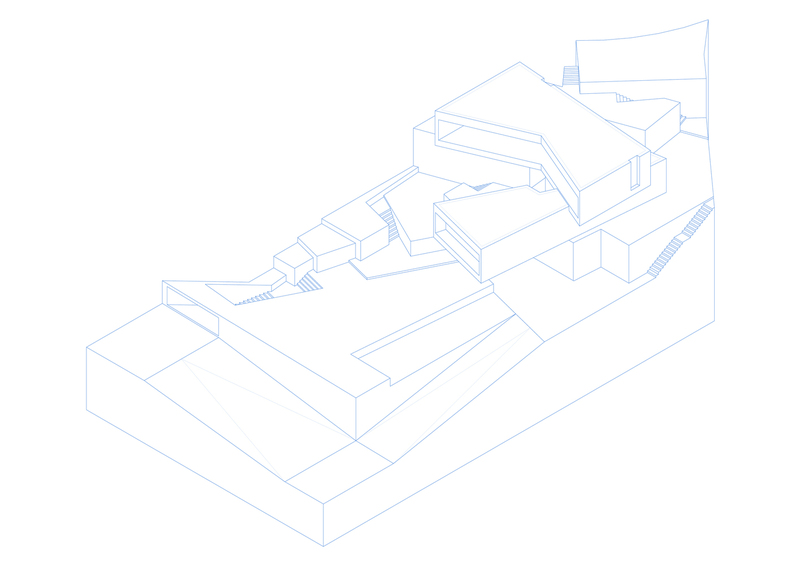 This irregular form favours the choice of reinforced concrete, due to its malleability as a structural element, and the choice of cantilever walls as a structural solution, which will allow the highlighting of the volumes of the house in the most expressive way: a massive exterior, which stresses the weight of the architecture, the ‘severity’, the overlapping of horizontal layers which look like JENGA, dominated by the laws of physics and balance. In this geometric operation of rotation, in spite of the enormity of the bodies, the construction expresses movement, enhancing the games of light and shade, just as the baroque twisting did, but with levels and meeting spaces of great cleanliness. 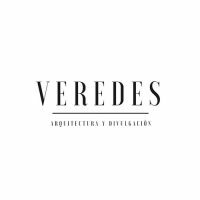 Both in these formal and functional structural premises, and the spatial relations within the interior of the house, light and pathways are the binomial through which the inhabitant interacts with the dwelling and the landscape, thus being the hand that shapes the concrete. If outside this contrast between hard and soft is created, between lifeless and living, inside there is a contrast between material and light, between earthly and heavenly; the inner space is diluted, it expands, its ignited, injected with light. The house fills itself with air, suggesting weightlessness, ascension, lightness. 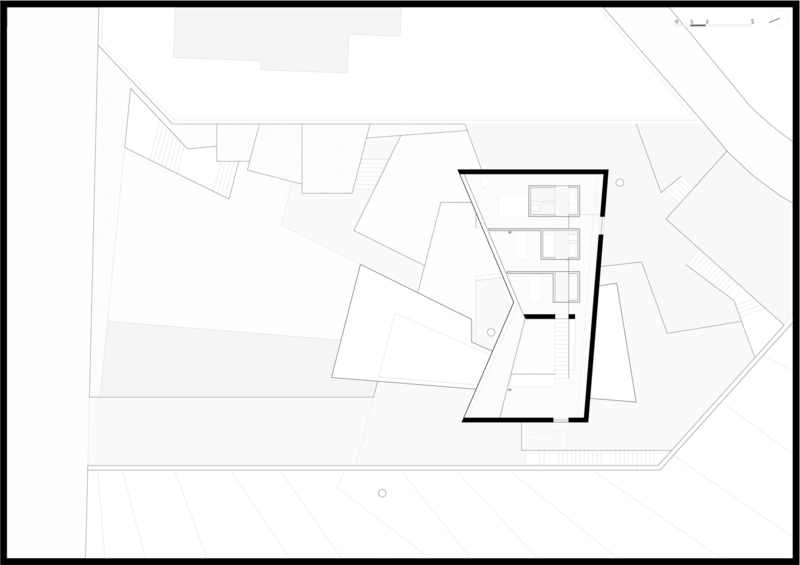 The central space, the convergence of the two bodies and the only space at twice the height of the house, acts like a hinge, a vertical axis which enables the rotation of the visual elements. 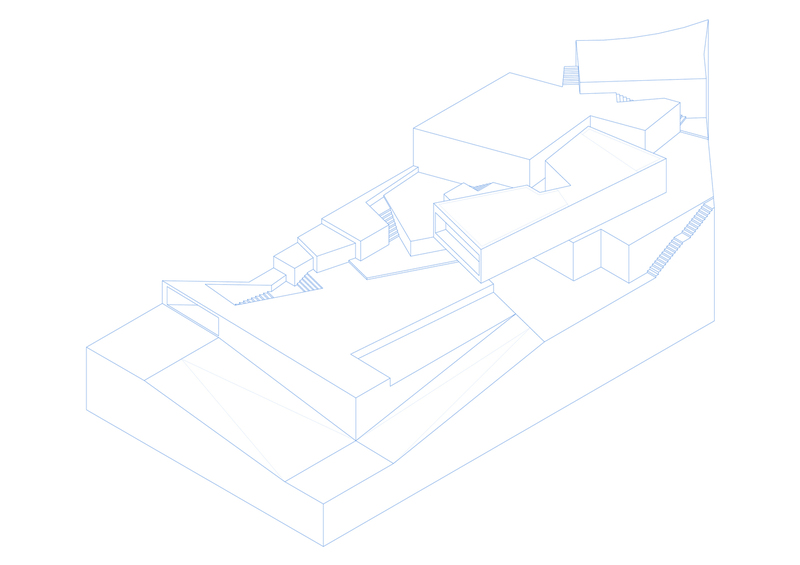 Here is where the staircase is situated, acting like a funnel and separating (although not physically), the uses of the ground floor kitchen and lounge, from the bedrooms and studio of the upper floor. In this way, the hallways mark the gradation of “solitude,” without needing to physically fragment the space, allowing for the understanding of the two volumes under the light as one room of great fluidity and enabling different levels of intimacy and opaqueness. The Aspre House does not produce indifference, but instead, in each area, it manages to transmit an emotion, frame and empower itself with a piece of the landscape, or hide itself from it, using architectural principles, treating itself like a further element of construction and producing structures situated in the landscape which simultaneously feed off of it.